Q: Who is the book aimed at? A: We didn't have a specific gtarget audience in mind, but obviously it has been of great value to (1) youngsters who never heard any of these programs when they first aired but have now sampled some on the Internet and want to know more, (2) mature folks, some of whom grew up with these shows, who want to know more about the cast, writers, directors, sound effects people, etc., (3) libraries and archives, (4) all those who are interested in Western history and its impact on popular culture. Special note: Radio Rides the Range includes the history of "The American Trail," the 13 episode program created by the Ladies Auxiliary of the VFW designed to highlight significant events iin American history. All 13 quarter hour programs can be heard on the Auxiliary's YouTube channel at www.youtube.com. If you're are a fan of the B western, you probably also listened to several - or many - of the western themed radio programs. Radio Rides the Range - A Reference Guide to Western Drama on the Air, 1929-1967 was edited by Jack French and David S. Siegel and is another great book from McFarland.About twenty Old Time Radio historians cover about a hundred programs, including some that may bring back fond memories. The programs mentioned above (Gunsmoke, Have Gun-Will Travel, Frontier Gentleman, Fort Laramie) are just four of more than 100 American West radio programs with half-hour or 15-mintute episodes discussed by various knowledgeable authors in a book that provides everything but sound effects. For the history-minded, some entries—like the ones on Fort Laramie, Tales of the Texas Rangers (1950–52), Wild Bill Hickok (1951–56) and Death Valley Days (1930–44)—not only describe each series but also say to what extent it was based on facts. The Lone Ranger, which first rode onto the radio airwaves on January 31, 1933, and made 3,377 broadcasts in 21½ years, gets plenty of attention, but so do lesser-known shows, including ones that might not have actually aired, such as The Adventures of Annie Oakley and Tagg. The Western radio world was a relatively small one and, as one might expect, a man's world. But Kathleen Hite wrote some of the best Gunsmoke episodes and 29 of the 40 Fort Laramie episodes, while Ruth Woodman (née Cronwell) created the long-running anthology show Death Valley Days. Many of the more popular shows were juvenile Westerns, starting with Bobbie Benson, the first version of which ran from 1932 to 1936. While the encyclopedic volume will be priceless to researchers, its topics will fascintate and inform readers for pleasure...One of the fine inclusions in the write-ups is that episodes, series and jobs in sundry mediums are cross-referenced by contributors. This helps readers grasp the immense significance of an individual or show as action spills over from one place to another. If you're are a fan of the B western, you probably also listened to several - or many - of the western themed radio programs. 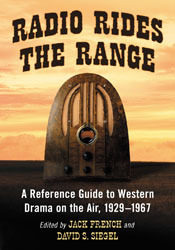 Radio Rides the Range - A Reference Guide to Western Drama on the Air, 1929-1967 was edited by Jack French and David S. Siegel and is another great book from McFarland. About twenty Old Time Radio historians cover about a hundred programs, including some that may bring back fond memories - you'll learn about radio's Lone Ranger, Tom Mix, Hopalong Cassidy, Gene Autry's Melody Ranch, the Roy Rogers Show, Straight Arrow, Ken Maynard's Tales from the Diamond K, Buck Jones' Hoofbeats, Red Ryder, Sky King, All Star Western Theater, Gunsmoke, Have Gun Will Travel, The Six Shooter, lots more. There's information on surviving audio copies, availability of original scripts, a year-by-year timeline of shows, and a two-page listing of obscure westerns where little if any info is available. Old Time Radio enthusiasts, whether they are collectors, writers, trivia experts or just avid lilsteners have a new resource at their disposal. Especially aimed at the thousands who enjoy the lore of the old west as portrayed during radio's Golden Age, Radio Rides the Range chronicles details of shows, both wildly popular and largely obscure in that category....Reading the book from cover to cover provides a fascinating thread of American history as it unfolded in an important time and place. (The book) is much more than a simple reference guide, or a simple appreciation of these old programs. What we get is an expansive encyclopedia of the western radio dramas that played such a large and significant part in the history of broadcast radio....Let me tell you to bite the bullet (an old westtern term) and buy this book. Yes, fifty bucks is a bunch of money, but this is a wonderful book. I loved the wiote-ups. I loved the meticulous attention to detai., I loved the wealth of information provided, and especially I loved the long, chatty, interesting articles about these shows. If you are a fan of OTRadio you will love this book.. This book is an absolute must for collectors and historians who want to have a handy starting point on western drama...The editors have taken a very clear, concise approach benefiting anyone who is starting out researching western-themed radio drama...When reading Radio Rides the Range prepare yourself for a remarkable ride through a time when the networks and syndicators presented the lands west of the Mississippi both in modern and very early times. If you are a radio drama researcher, this book should be on your shelf, and if you are interested in western-theme radio drama, this book is a certainly a must. Jay Hickerson, Publisher of "The 4th Revised Ultimate History of Network Radio Progamming and Guide to All Circultaing Shows"
This is one of the most informative books on OTR ever written. I used much of the material to update my Ultimate History. Fran Striker, Jr., son of the Fran Striker, Sr., the creator of the Lone Ranger, and the author of a biography about his father. Frank Bresee, Little Beaver on the popular juvenile series Red Ryder and host of the popular radio program, Golden Days of Radio . Copyright Radio Rides the Range, 2013. All rights reserved.